The modification provides a way to add a pause button on SMS joypads with no rewiring and minor modifications on the power base's side. It works by tying two opposite directions of the pad to ground, making an "impossible" combination which can be detected to trigger an NMI. One of the two possible opposite direction pairs (Up and Down for instance) has to be connected to one end of a miniature pushbutton via diodes. They are used to make the connection only one way, so as to prevent shorting both. 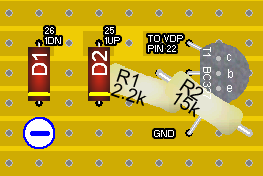 A two-pole button can be used without diodes. The other end of the pushbutton is simply connected to ground. The wires are soldered directly to the joypad's PCB. The diodes don't need to be of any special type: 1N4148 or 1N400x are examples. The easiest way to place the button is in the middle of the joypad, where the two PCBs are split. The front shell of the joypad needs to be drilled and a plastic thread needs to be cut in order to fit the new button. A small piece of high density foam behind it will make it steady enough. The circuit is equivalent to a OR gate with an open-collector output. 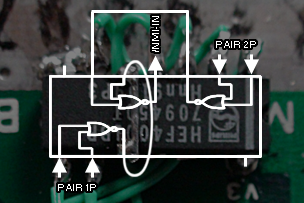 When both inputs are low the NMI-IN line is put low, which simulates a press on the pause button. The strip board can be drilled and fixed backwards to the main PCB by screwing it next to one of the joypad ports. This makes it easy to remove and minimizes the risks of short circuits. The wiring to the 315-5216 chip has to be made according to which pair of buttons was chosen as a trigger. This version is more efficient, less bulky, and requires only a quad NOR gate (CD4001 or 74**02) and a diode to make the mod work on both ports. Three of the four gates are used. The inputs have to kept in pairs (1P on one gate, 2P on another gate). 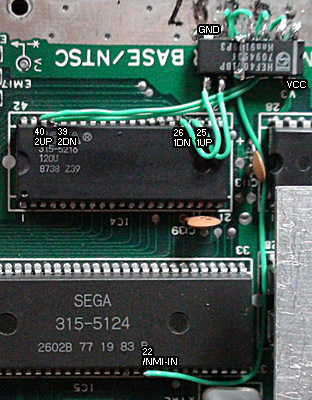 Refer to the 315-5216 chip pinout to match the joypad's wiring. 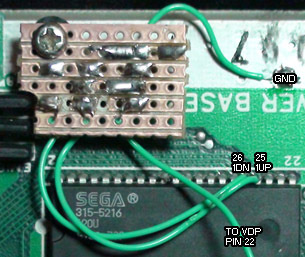 Important: The diode (not shown) has to be placed between pin 4 (cathode) and the wire to pin 22 of the VDP, to prevent the real pause button to fry the gate's output. Another solution can be simply cutting the ground pin of the pause button, making it ineffective. The chip's pins are shortened and those from the unused gate are completely cut off. The power pins can be soldered directly to the main PCB: pin 14 on the border's ground plane and pin 7 on the "V3" marked solder point (+5V). Pins 5 and 10 can be directly bent and bridged over it. 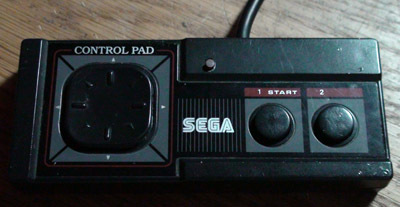 A late official Sega note about Genesis joypads states that heavily used ones could produce these up/down left/right combinations, and that care had to be taken by developers to make the software ignore them. Unwanted triggering can therefor happen with well worn joypads. Adding a small adhesive pad to the center back of the directional cross to raise the pivot point can often fix this issue. Electrical noise should not affect the NOR gates, but if it's the case, a 10nF ceramic capacitor over the power pins (7 and 14) will help.